The renowned small arms designer Mikhail Kalashnikov passed away on December 23. His name became synonymous with the assault weapon popularized in armies and conflicts around the world. Mikhail Kalashnikov, who invented the world’s most copious rifle bearing his name, passed away on December 23 after a prolonged illness. He was 94. 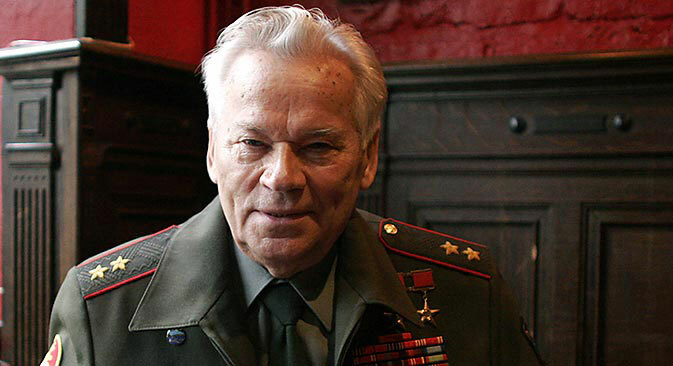 Kalashnikov had been in intensive care in the clinical diagnostic center of Izhevsk, where he was hospitalized due to gastric bleeding, since November 17. During the past 5 weeks, word from Izhevsk was that he was feeling better, but on Monday, doctors announced that his heart had stopped. Kalashnikov was glorified in the former Soviet Union for creating an assault rifle that experts call the best in the history of small arms, the AK-47. Famous arms designer Mikhail Kalashnikov died in Izhevsk at the age of 94, head of the Udmurtia presidential and governmental press office Viktor Chulkov posted in a social network on Dec.23. Kalashnikov came from a peasant family, and as a child was very interested in technical subjects. At the age of 18, Kalashnikov was drafted into the Red Army, where he, to the surprise of many, displayed wit and ingenuity, suggesting ways to improve the engineering designs of tank guns. In August of 1941, Kalashnikov went to the front. Two months later he sustained a serious injury and was taken to the hospital, where he spent most of his free time working on plans and sketches for the future AK-47, which would eventually immortalize the name Kalashnikov. The engineering ideas proposed by Kalashnikov did not go unnoticed by the largest gunsmiths of that time, and Kalashnikov was assigned to the Main Artillery Directorate of the Red Army, where he later headed the design bureau. Kalashnikov constructed his famous assault rifle in 1947. Since then, the world has collected more than 70 million units of all modifications of the rifle. Today, the AK is used by security agencies in over 100 countries and is included in the list of outstanding inventions of the 20th century. During his life, Kalashnikov won dozens of government awards and became a true legend not only on a national but also on a global scale. "Kalashnikov was our national treasure, a man who is born once in a thousand years. By his engineering genius he surpassed a constellation of outstanding gunsmiths," said Igor Korotchenko, the chief editor of National Defense. Korochenko said he frequently met with Kalashnikov and has fond memories of him. “Mikhail Kalashnikov, despite his age, remained serene. Although, the years certainly affected his physical condition, he lived for the interests of the plant and thought globally." According to Korochenko, Kalashnikov actively campaigned for a ban on the uncontrolled proliferation of small arms and for the implementation of supply exclusively through government agencies. "He always said that rifles do not kill, people kill," Korochenko said. Dmitry Litovkin, an expert on military weapons and affairs, said Kalashnikov was a living legend and a symbol of the fact that Russia is able to produce the best weapons in the world. "Kalashnikov created an ideal and very effective weapon, which is first of all, simple to produce, second, cheap to manufacture, and third, does not require major military training,” said Litovkin. “It's a weapon for the masses that has found a consumer. The Kalashnikov assault rifle can be drowned in water, in mud, it can be not cleaned for a long time and it will still shoot. Even American soldiers in Iraq and Afghanistan, if there is a need and an opportunity, always use a Kalashnikov because it really is more efficient than the M-16. " In the mid 1940s, the Soviet army was mostly using Mosin rifles, while the German army was using automatic weapons, and thus the Wehrmacht firepower was superior to that of the Red Army, Litovkin said. Ruslan Pukhov, the director of the Center for Analysis of Strategies and Technologies and member of the Public Council under the Ministry of Defense, said that the Kalashnikov rifle played a significant role in the course of armed conflicts that took place in the 20th century in various parts of the world. "I think that as a result of this assault rifle being made by the Soviet Union, various revolutions happened quickly and the rebel movements developed successfully. A Kalashnikov rifle could be handed to a teenager somewhere, for example, in Africa or to a farmer in Vietnam, and he could immediately start fighting against a well-trained American soldier,” Pukhov said. “The concept of simplicity and deadliness is a unique quality of the assault rifle, allowing it to become more than just a weapon. Kalashnikov revolutionized military affairs." Igor Korochenko said that a Kalashnikov rifle is a fail-safe in any conditions, whether in the desert or in Polar regions. "No Western weapon can boast such characteristics," he said, adding that at this time the Kalashnikov an be stocked with laser sight and a night vision devices. Currently in Russia, testing of the latest modified assault rifle, the AK-12, is coming to an end. The results of the testing will determine whether it will be adopted for use by the army.